Congrats to Claudia, today’s Featured Stamper (FS229) at Splitcoast! I chose Forever Together to case. I kept the general layout, sentiment as focal point, and monochromatic color. I changed the images, added some inking to age mine and rotated the layout. I was also inspired by Amelia Tunic from yesterday’s IC challenge. All images are Our Daily Bread designs. I’m just loving this crochet bg image. For my card, I wanted to stay monochromatic but I also wanted it to show up. So I white embossed it on white vellum and inked the edges w/ the antique linen ink. When I attached to the front of my 4.25 x 5.5 ivory card, it was even more visible. I noticed the vellum warped a little at the top, but vellum can tend to stretch when embossed and to me, it looks more like real lace. 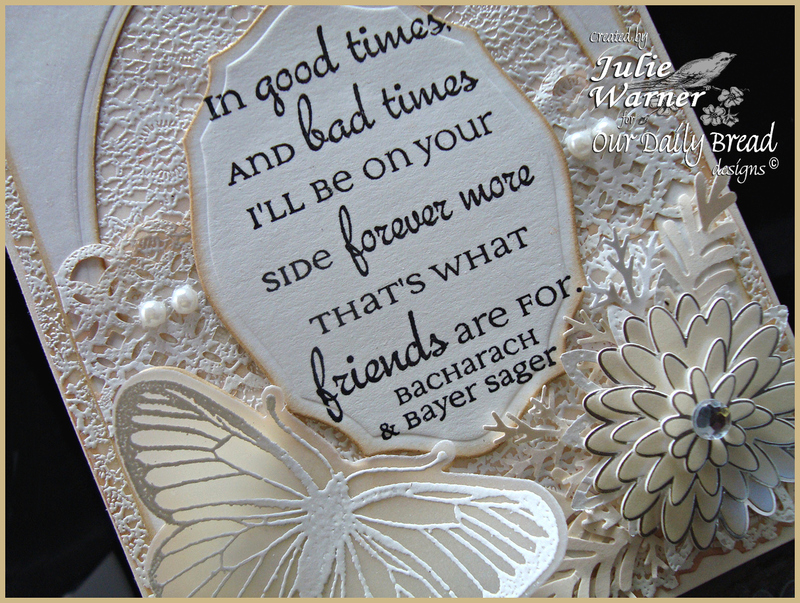 The sentiment was stamped on white, cut w/ an ODBD custom die label one, and aged the edges. 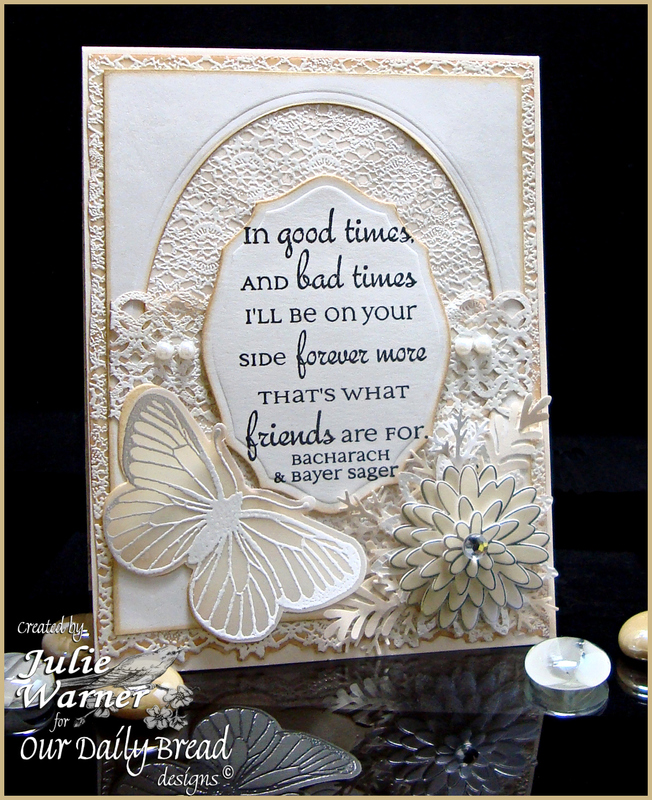 The butterfly was also white embossed on vellum and die cut w/ a backing vanilla piece of paper (another ODBD die). On some leftover embossed crochet bg, I used a double border punch and attached this over my white frame then attached the sentiment on top. I added the Jolee’s flower and some ivory and white punched branches. For today’s Ways to Use It Challenge at Splitcoast (WT328), we were not to use ANY white c/s. This is a special wedding card and I didn’t use any white c/s. I found the outside little ribbon/tulle centerpiece and Mr & Mrs tag on clearance and I added a die cut fancy tag out of metallic gold in between the two for the main item on the outside. All images Our Daily Bread designs. I used two sizes of the Labels 17 to make a frame thru the ivory shimmer and brushed gold c/s and behind them I stamped the crochet bg in gold ink. I added some wide ribbon before attaching it to my A7 ivory card. The big surprise w/ this card is the inside so I’d love for you to check out the next pic. I just love paper engineering but this one really tested me, lol! 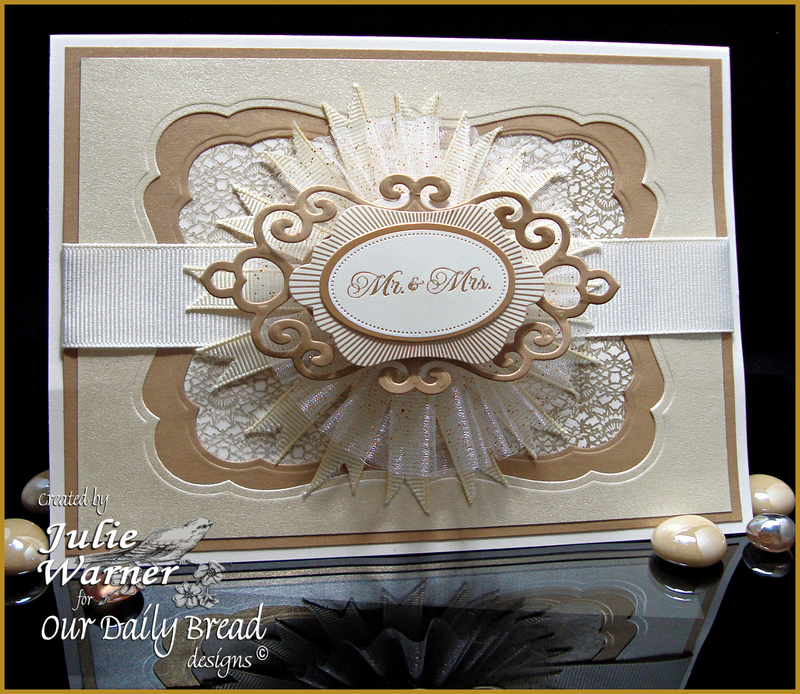 I gold embossed the greeting on ivory c/s, die cut w/ a Labels 10 and attached it on top of a brushed gold Fancy Tag. 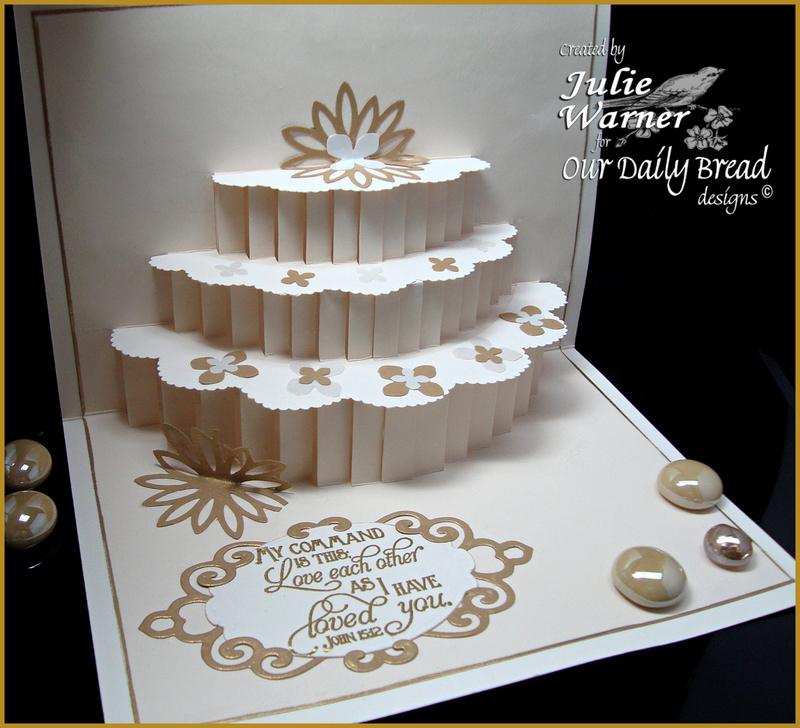 On a slightly smaller (than the A7 ivory card) piece of vanilla c/s I placed the pattern I found for the Wedding Cake on a lovely blog I came across. I love popups and I haven’t done one in a long time so I gave it a try. After doing all the cutting and scoring, it took a while to get all the folds going the right way. Then I added the scallop top pieces to the cake along w/ some punched flowers. I think the happy couple (my DH’s nephew!) will be surprised when they open it! I started out round…you can see by the center layers. But this card just wanted to be square. Who am I to argue? So I’ll just be hangin’ out by the back door and hopefully I won’t be alone. All images are Our Daily Bread designs. I stamped the crochet circle image 3 times, colored two and cut them out in layers. One water colored flower only. Two was the the inside circle, cut w/ a Spellbinders circle. 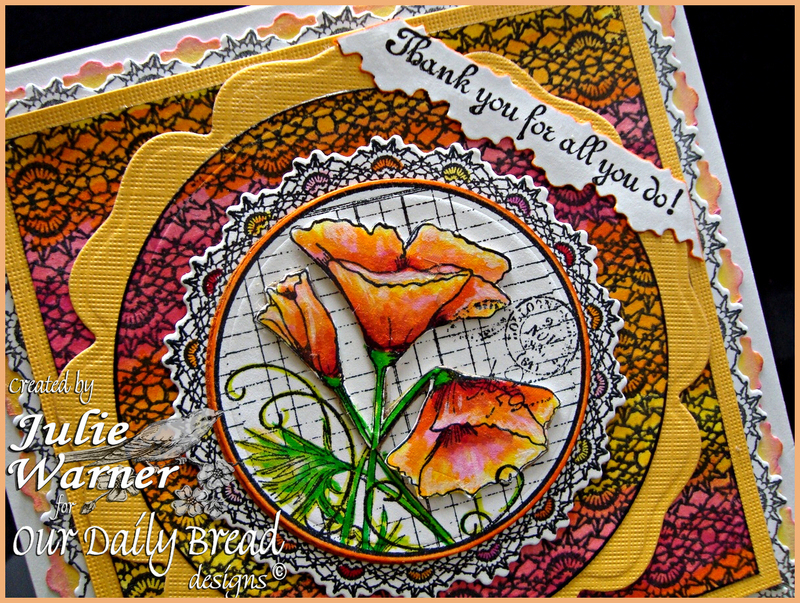 Third was the whole image cut w/ an ODBD matching crochet circle die. 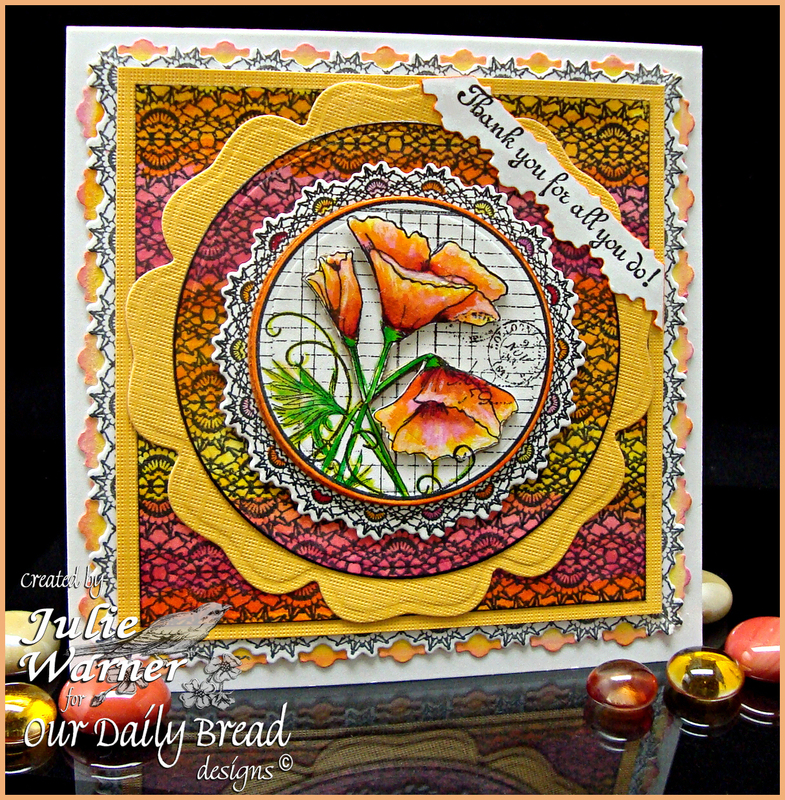 For the big circle and square bg, I used water colors to make the bg and then stamped the crochet bg on top. I stamped and cut (w/ the matching ODBD border die) 4 strips of the crochet border to make the frame. As I was putting it together, I got to looking at the negative strips and decided to use them as well. So I added a little color to them and attached them offset behind the crochet borders. The sentiment is also on one of the negative strips. The finished card measures 5″ square.